• The ape cry was not used in this film.  A race of strange people on a remote forbidden island named Aquatania are exploited by their power-mad high priest, Palanth (above and left), and a profiteering accomplice from the mainland named Varga. Varga poses as the Aquatican's god, Baloo, and demands that the superstitious natives dive for pearls as an offering to their god. A beautiful young woman named Mara (above and left) flees the island when Palanth demands that she marry Baloo. She is determined to find her lover, Tiko, who has been banished by Palanth because of his love for Mara. 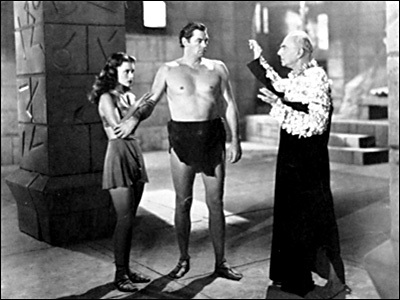 She becomes entangled in Tarzan's fishing net and he and Jane offer to help her people. Palanth's followers abduct Mara and Tarzan tracks them back to Aquatania, while Jane and Tiko summon the commissioner from Nyaga. Tarzan poses as Baloo and orders Palanth to change his ways and Palanth threatens Tarzan with the wrath of Baloo. Varga organises for the capture of Jane and the commissioner before his pearl stealing racket is uncovered. 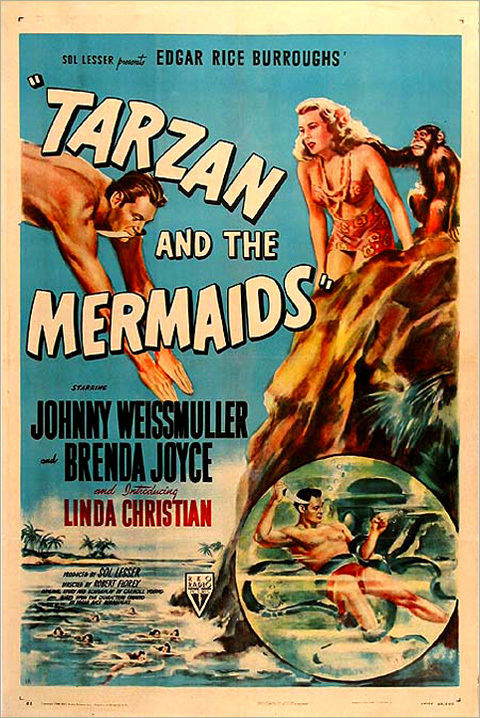 Tarzan battles his way to save Jane and his friends, unmasks Varga in front of the Aquaticans, and hurls him to his death on the rocks below. Mara and Tiko are now free to marry.